When I made the villages of Rodanthe, Waves and Salvo my home, it didn’t take long to realize that it was also home to a cast of colorful characters. Among these native residents was Clarence Midgett, better known as “C E”. His family history goes back many generations on Hatteras, and it has been documented that they were some of the original settlers coming to the island after surviving shipwrecks centuries ago. C E’s great-grandfather and namesake, Clarence Ezekiel Midgett was a member of the early US Coast Guard. Stationed at Chicamacomico during World War One, Midgett took part in the famous Mirlo rescue of 1918. They saved the lives of 51 sailors from a burning British tanker that had exploded offshore after running into a German mine. C E was really proud of that legacy. C E was also fortunate to have grown up on the island when the atmosphere was much more rural than it is today. The spaces were wide open then. The island world was their “oyster”. You could hunt, fish, surf, party and even work unencumbered. There were no crowds to get in the way. I must admit that C E was probably a part of what secured me to this area. The native folks are a unique breed, generous, mostly independent and don’t require much to get by. They still are my kind of people. In the 70’s and 80’s, C E was a part of a crowd of locals that I used to hang out with. You could always tell when C E was around. You could hear him talking and laughing louder than anyone else. Like many of the native sons, he loved to fish, either from the pier or commercially, with nets in the sound. Most likely, you could find C E around the creek in Rodanthe. 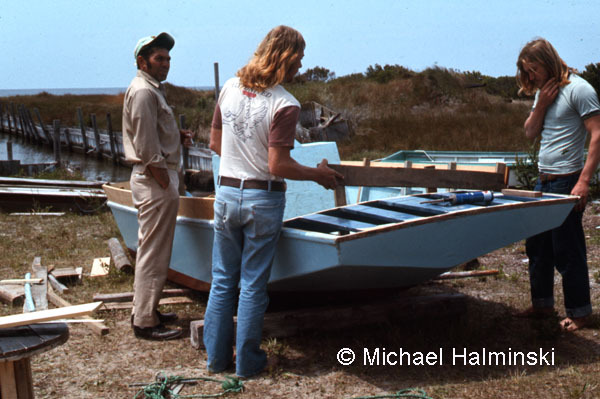 Here he works on a skiff with his cousin Bruce Midgett (right), while D B Midgett (left) looks on. Photograph was taken 1975. 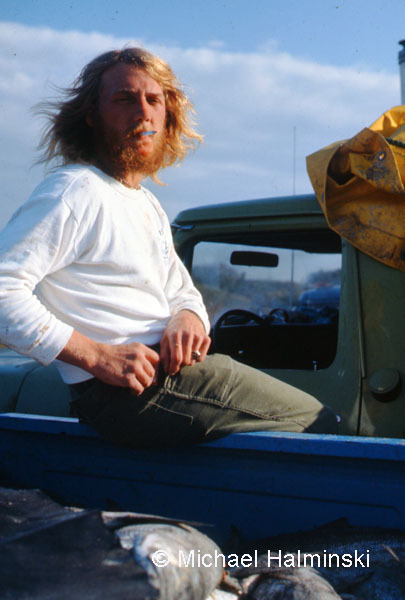 C E Midgett at the Rodanthe creek as a “Marlboro Man”, 1974. 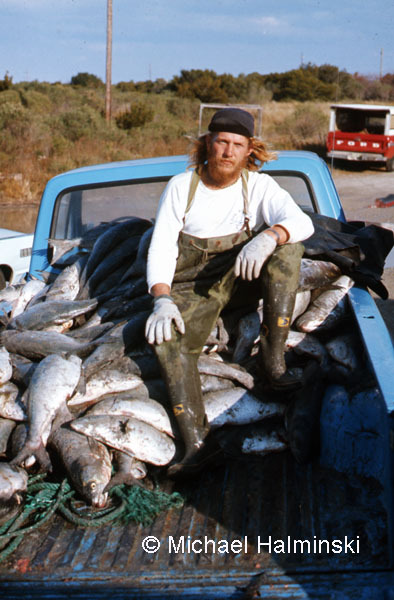 C E sits atop a catch of big bluefish in 1974. C E Midgett also had his moments of mischief. 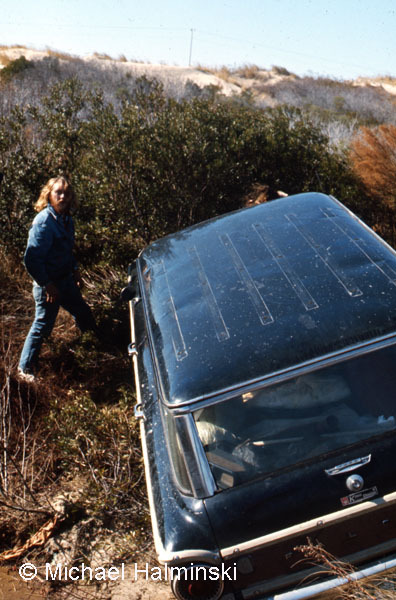 This time he drove this Falcon station wagon off into a ravine in Nags Head, near the present day Village Golf Links. The cops came and didn’t even give him a ticket. 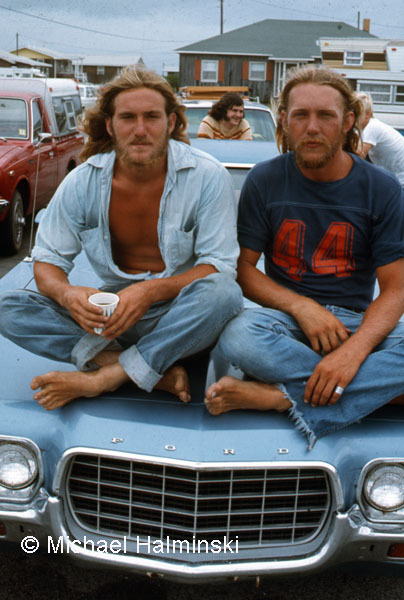 Bruce Midgett (left) celebrates Midgett Day with C E in 1975, on the hood of his Ranchero. Gerald O’Neal and Richie Austin converse in the background. 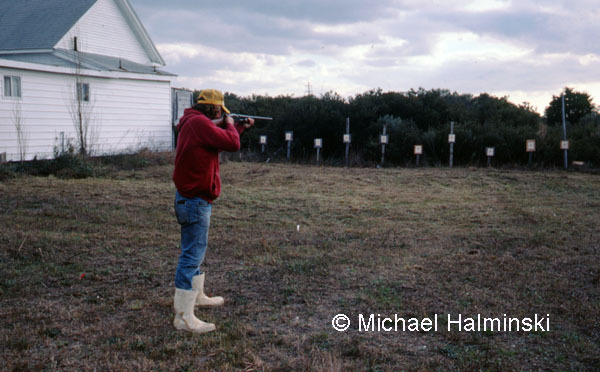 C E competes in the oyster shoot at the Old Christmas celebration in 1985. Sadly, C E passed away on October 23rd after a prolonged illness. This entry was posted in commercial fishing, boat, pamilco sound, gillnetting, Outer Banks, People on November 7, 2011 by j0jgvm89bj.